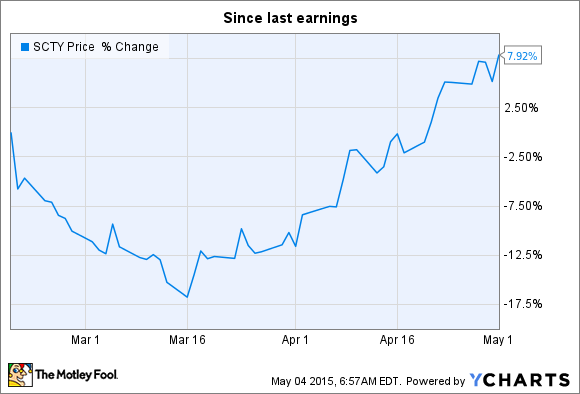 Will SolarCity Surprise or Disappoint With Earnings? SolarCity has added new services and expanded to several states since February. Should investors expect an earnings beat, or get ready for a letdown? While the drop was fueled by a small shortfall in megawatts deployed in the quarter -- mainly due to lumpiness in the company's commercial solar business -- the overall growth rate, largely driven by the strength of its residential business, remains incredible, and part of what makes the company such a compelling investment. Let's look at what has happened at SolarCity since the last earnings report. While we might not be able to predict its upcoming quarterly results, now is a great time to reevaluate the strides the company has made in the past few months. Since March, SolarCity has expanded into New Mexico and New Hampshire, and added new offerings in Maryland, Pennsylvania, and Texas, increasing the number of potential customers, by my count, by millions. The company also launched its power storage program with partner Tesla Motors, making it available in all of SolarCity's current markets. While these are great steps, they will likely have little to no impact on the quarterly numbers the company will report this week, since most of the announcements took place in March or later. However, SolarCity also announced expanded operations centers in Nevada and California, necessary steps to meet burgeoning demand in both new and existing markets. The company has also partnered with DIRECTV, which is a SolarCity commercial customer, and smart thermostat maker Nest Labs. In all, it was one heck of an active quarter of expanding operations and increasing brand awareness. SolarCity's guidance for the coming quarter is for 145 megawatts of new systems, which would work out to 77% growth from the year-ago quarter. If there's one thing that makes me somewhat confident the company will reach its target -- after SolarCity came up a bit short in the previous quarter -- it's that management revised how it issues guidance. On the last quarter's earnings call, CFO Brad Buss owned up to the fact that commercial deployments negatively affected the company's results in the preceding two quarters. Thus, the company would from that point only include commercial contracts that were finalized and already under way and on track to complete in the quarter being forecast. Of course, this is no promise of meeting guidance. But by increasing the requirements to forecast these commercial deals, which can be very large, complex, and take months to complete, management has added a higher level of predictability to how it projects sales. That is better for investors, even if only in the short term. SolarCity is also expected to report another fairly large loss, as the company pours huge sums of capital into building out its customer base of largely leased solar systems on which it will collect payments for 20 years each or more. The company is using substantial debt to front these costs, and added $1.75 billion in new and newly activated credit facilities in the quarter. As this new debt is tapped, the funds are essentially immediately attached to those long-term contracts. As time progresses and its scale builds, SolarCity's profits will come from the growing spread between its cost of debt and the payments received from its customers. Through the end of last quarter, SolarCity had more than $5 billion in nominal future payments under contract, with a whopping $3 billion added in 2014 alone. This is the coming cash flow that is central to the company's future as an investment. The company is forecasting a drop in revenue from the year-ago period, almost entirely due to large cash sales in that period, which are recognized essentially all at once when the system is installed and paid for by the purchaser. But if we look just at operating lease and incentive revenues (the former of which is recognized only as each monthly payment is made), the company is projecting between 62% and 79% growth. This context is important to understand how the company's revenue comes in and is counted, as well as to better measure how install growth translates to actual revenue, and eventually to positive cash flow and profit. SolarCity is spending a lot of money now to expand into new markets, and to grow inside existing markets, to meet explosive demand for solar systems. The company's operating expenses reached $135 million in the fourth quarter, and SolarCity expected to spend between $148 million and $156 million in the first quarter, which would work out to as much as a 16% increase sequentially and almost double the $81.7 million spent in last year's first quarter. Neither how close to these metrics the company will come nor how Mr. Market will respond to the news is easy to accurately predict. Quite frankly, the short-term accuracy of those predictions is less important than what happens over the long run. A better way to use the information? It's new data, information that we can add to what we already know to see whether the company is truly moving closer to profits or taking a step back. Looking for more? Be sure to tune in here when earnings are released on May 5 for our recap.